Rooms: with bathrooms. Bungalow consists of: 2 bedrooms, living-room with kitchenette, bathroom. At guests' disposal fully equipped kitchenette. The facility is open: during summer holiday. Rooms with bathrooms. Rooms are equipped with: cordless kettle, TV. On the premises fenced parking lot. Additionally on the premises: garden, place for grill. The facility for non-smokers. To the beach 100 m.
Bungalow consists of: living-room, bedroom, kitchen, bathroom, terrace. On the premises free parking lot. To the sea 300 m. To the grocery 250 m. We warmly invite you to a holiday! Tourist attractions: architectural monuments, nature monuments. At guests' disposal café MuMu. We offer: home-made cakes, hot drinks. Rooms with bathrooms. Additionally on the premises place for bonfire, place for grill. For the active guest we offer: basketball field, volleyball field, football field. Rooms with bathrooms, with balconies, with a view of the sea. Rooms are equipped with: satellite TV, beach equipment. We perfectly organize: conferences. We offer rich menu. Bungalow consists of: living-room, kitchenette, bathroom, 2 bedrooms. Bungalow is equipped with: TV set, beach equipment. The facility is open from June to September. We invite you to take advantage of our offer - satisfaction guaranteed. Rooms with bathrooms. Rooms are equipped with: TV set, radio, beach equipment. Bungalow consists of: kitchenette, bathroom, 2 bedrooms. Bungalow is equipped with: satellite television, beach equipment. Rooms: with bathrooms and kitchenettes. Rooms are equipped with: cordless kettle, radio, beach equipment, wireless Internet access (Wi-Fi). On the premises: parking lot. The facility is open: from May to September. To the beach 70 m.
Rooms: with bathrooms. Room is equipped with: cordless kettle, fridge, TV. On the premises: parking lot. The facility is open: from May to September. Bungalow consists of: living-room, fully equipped kitchenette, bathroom, bedrooms, terrace with exit to the garden. For children: play-ground, slide, swings. To the beach 400 m.
Rooms: with bathrooms, with separate entrance. Room is equipped with: fridge, TV. Bungalow consists of: 2 bedrooms, kitchenette, bathroom. On the premises: parking lot. The facility is open: from May to September. On the ground floor: living-room with kitchenette, bathroom, terrace. Upstairs 2 bedrooms. On the premises parking lot. We warmly invite you to a holiday! Room is equipped with: radio, TV. Some rooms: with balconies. Rooms: with bathrooms. At guests' disposal: generally accessible self-service kitchen. The facility is open: from May to September. The facility is open: from May to September. On the premises: parking lot. 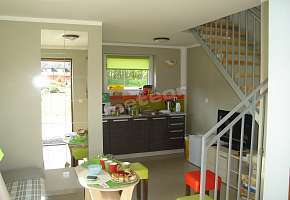 Apartment consists of: 2 bedrooms, bathroom, terrace, fully equipped kitchen. On the premises: parking lot. The facility is open: from May to September.